Bassmaster Magazine is the official magazine of BASS, a worldwide membership of more than 1/2 million bass anglers. Bassmaster's purpose is to educate, inform and entertain while promoting and enhancing the sport of bass fishing. 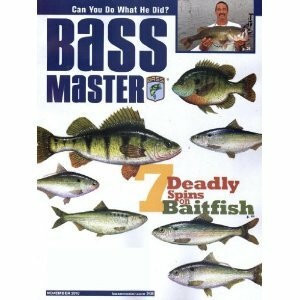 Filled with tips and techniques to help you catch more and bigger bass, Bassmaster includes secrets of the winningest pro fishermen, the hottest new lures, the best bass lakes and rivers, the effects of weather, tackle selection and how to use it, boat and accesssory reviews, tournament reports and more. All but $1 of the cost is applied to Bassmaster magazine.